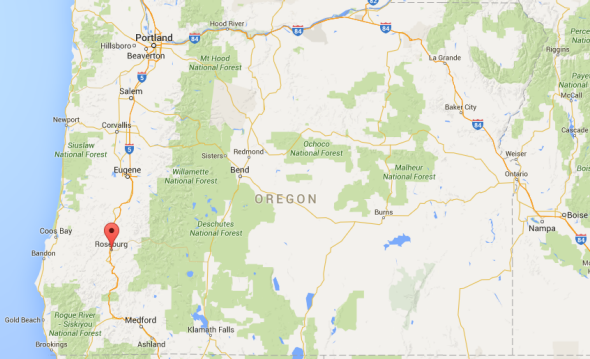 Mass shooting in Oregon: The Thursday Slatest. Roseburg, Oregon, where at least seven people were killed today at Umpqua Community College. At least ten people were killed in a massacre at Umpqua Community College in Oregon. A suspect was reportedly detained, but it’s not yet clear what the motive behind the shooting was. DMVs are closing in disproportionately black counties in Alabama, where ID is required to vote. A Planned Parenthood clinic was set on fire near Los Angeles. Bernie Sanders has raised a ton of money, and that’s not great news for a certain former Secretary of State. Hurricane Joaquin is approaching the East Coast but no one is quite sure what he’s going to do when he gets there. A bipartisan group of senators has a plan for a bill that aims to reduce the federal prison population. Donald Trump says he would ship Syrian refugees back to Syria. Have a good day out there and be safe.